Days are getting shorter, temperatures are slowly starting to drop, the green colours outside your window will soon be replaced with different shades of yellow, red and brown... All this can only mean one thing - the new Winter season is getting closer and closer! Just around the corner are action packed days of fun on the slopes and evenings of divine relaxation. And if you have the energy in you, why not even dance the night away and do it all over again tomorrow! 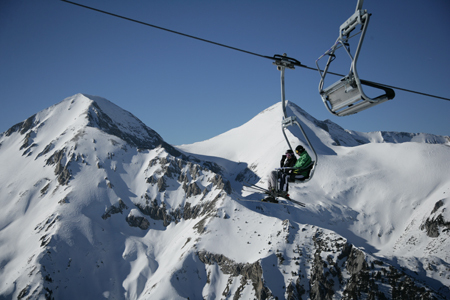 Chairlift ride over the slopes of Bansko. Next Monday (3 September 2012) we will be launching the second edition of our Winer 2012/2013 brochure. Inside you will find - all of our deals and discounts, prices, flight programme and everything you need to know about our hotels, destinations and package holidays, all packed in 60 pages with a new design and layout. Low Deposit of just £70 per person. Early Booking Discounts of Up to £150 per couple. Special Offers on Most Hotels. FREE Ski & Board Storage in Bansko. 50% OFF Ski or Board Carriage. FREE Lift Passes in Bansko & Borovets. FREE Night Skiing in Pamporovo. 50% OFF Ski & Board Packs in Borovets. 20kg of Luggage FREE on All Bulgaria Charter Flights. Also new for season 2012/2013: we are introducing three 4-star hotels to our program - Aparthotel St. George in Bansko, Hotel Yanakiev and Hotel Iceberg in Borovets.